Incredible night. Incredible playoff run. The perfect ending to the greatest season in Red Sox history. And I don’t use the word “perfect” lightly. Chris Sale dropping Manny Machado to his knees with a nasty slider to win the World Series was the ultimate storybook ending. This team was doubted all year long despite winning 108 games. I’ll admit I had questions about the bullpen at times and the inconsistency of certain starting pitchers. But man did they shut us up in October. David Price was 0-9 in career postseason starts before winning three in a row. The Sox won his last four starts going back to Game 2 against Houston. He completely reversed his legacy in a matter of 15 days. Game 5 was the best performance of his life and it won him a ring. Nathan Eovaldi and Joe Kelly are both borderline unhittable when they have their best stuff, and apparently they thrive under pressure. Last month, there were questions about whether or not Kelly would even make the postseason roster. He was dominant in all three series’. Nobody thought much of Eovaldi when he was acquired at the deadline, but he showed flashes of brilliance and then put it all together in the playoffs. That Game 3 loss was one of the gutsiest outings in World Series history. Chris Sale was the best pitcher in baseball all year and his competitive nature was contagious. That was never more evident than when he went full Papi and screamed at everyone in Game 4. It was only right that he was on the mound to finish things off. E-Rod, Porcello, Brasier, Barnes, even Kimbrel settled down. The starters and relievers were incredible. They all had their best stuff when it mattered most and they all deserve to hoist that trophy. Beyond the pitching, every single player on the roster contributed. It was amazing to see Mookie and JD homer in Game 5 because they had both been struggling, but role players like MVP Steve Pearce were there to pick them up every step of the way. JBJ might not get many hits, but he makes them count. Ten postseason RBI’s. Benintendi continues to work his way to becoming one of the great all-around players in baseball. Along with Mookie, they make up the best defensive outfield in the Majors. Rafael Devers and Xander Bogaerts both played great defense and contributed at the plate. Bogaerts drove in seven postseason runs and the 21 year-old Devers drove in nine. Christian Vazquez and Sandy Leon are two of the hardest-working catchers in the league. Their ability to call a game was so valuable to this team all year long. Their batting averages might not be pretty but they always seem to come through when it matters. Brock Holt was born to play baseball and he was born to win. The guy can play damn near every position on the field. He was an All-Star three years ago and now he’s a utility player, but he never complains and he’s always ready when his number is called. Insert him into the lineup and he might just become the first player ever to hit for the cycle in the playoffs. Mitch Moreland was an All-Star this year and came through with one of the biggest hits of the season with the Sox down 4-0 in the seventh inning of Game 4. Eduardo Nuñez played through injuries and delivered a three-run dagger in the seventh inning of Game 1. Both were pinch-hit situations, and both made Alex Cora look like an absolute genius. And who’s to say he isn’t? As far as I’m concerned he’s the best rookie manager of all-time. His ability to adjust the lineup and keep all of those talented players involved and engaged speaks volumes about his leadership abilities. And with all due respect to John Farrell, Cora seems to be much more relatable to the younger players. From management down to the bottom of the roster, this is the most complete team in Red Sox history. The record says it all. Credit to Dave Dombrowski for putting it together. 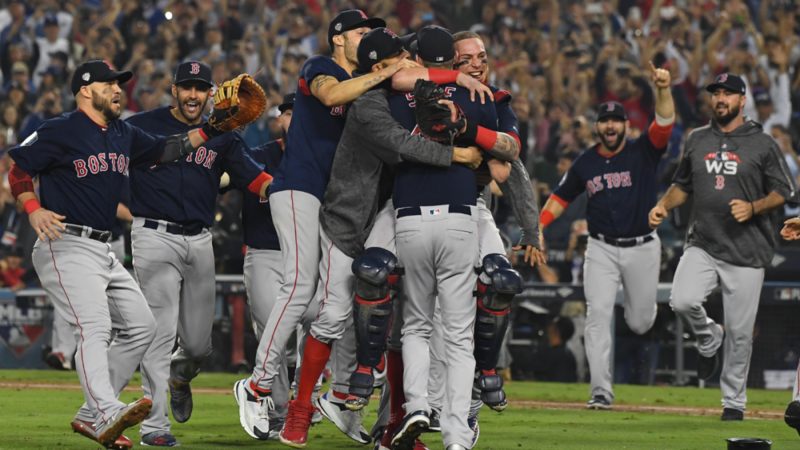 The Red Sox have now won four World Series titles since 2004. Boston’s four major sports teams have won 11 championships since the 2001 Patriots. Each one of those 11 teams had their own unique story. There’s a lot to dissect with this one, but the overall synopsis is that we never should have doubted this team at any point. The amount of criticism they received during the regular season while sitting firmly at the top of the division was uncalled for, and they made everyone eat their words. Every single question was answered. They finished 119-57 including the playoffs, and were every bit as good as that record indicates. I’ll be writing plenty more about this team in the next few days. Like I said, there’s a lot to cover. This one was about giving everyone their due credit and appreciating this Red Sox team for what it is. The greatest ever.